I purchased this whelping box from the Whelping Box Store because of the price ($115) and because it was made of wood. I also liked the fact that it did not have a floor. I would rather have plastic covered with blankets that I can easily replace. A solid wood floor gets too stinky after a while. I ordered it on February 7th and did not receive it until February 18th, even though it was promise to arrive before the 17th. It was very easy to put together and I set it up in a quiet corner in the family room where I could easily keep an eye on it. 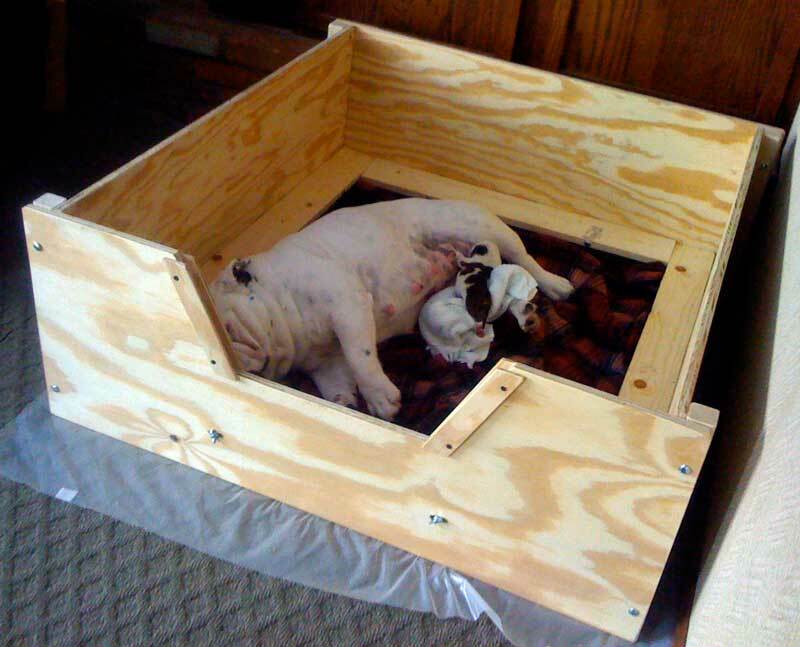 This is the medium size box and advertised for English Bulldogs, however, I would NOT recommend this box for Bulldogs because the entrance is much too high for the dam to climb in after a cesarean. Also the bottom of the entrance is not protected with a nice smooth finish like the sides. This entrance is placed much too high for any short-legged dog. I solved the problem by propping pillows in front of the entrance and laying blankets over the sides and bottom.